Momo Food and Wine is a casual and sophisticated addition to an up-and-coming area of Midtown. Photo by Matt Kelly at Phuture Photography. 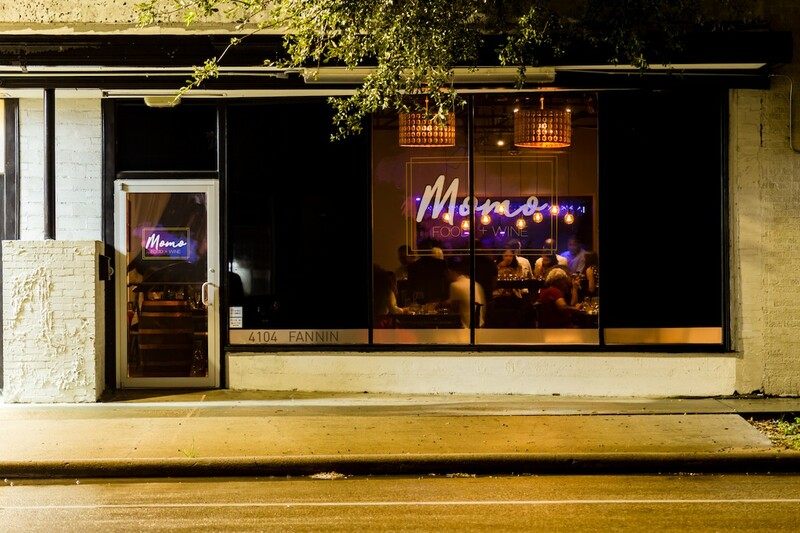 At night, golden light spills from the windows of Momo Food & Wine at 4104 Fannin in Midtown onto the sidewalk outside. A peek inside reveals an industrial-chic but warm, welcoming atmosphere. It manages to feel both modern and intimate; a professional space with a personal touch. 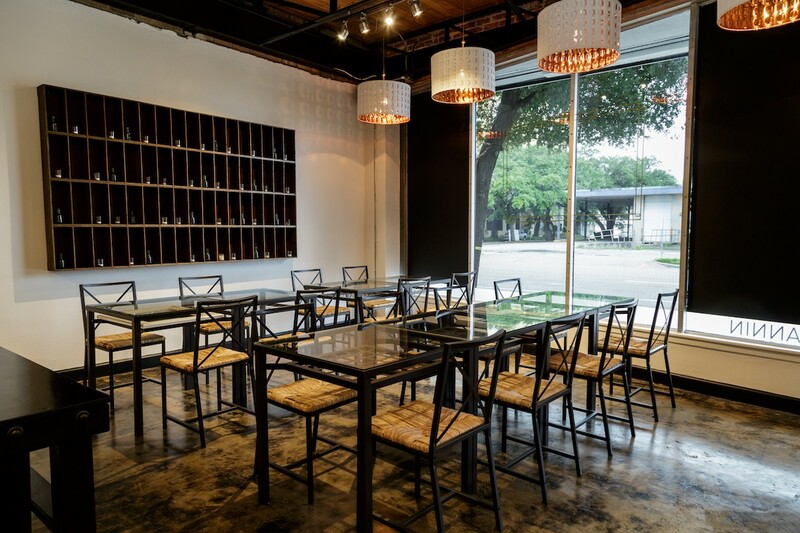 The interior at Momo Food & Wine features a sleek yet cozy ambience. Photo by Matt Kelly at Phuture Photography. With an emphasis on tapas-style dishes, the menu lists snacks and small plates that span global cuisines but the selection still manages to not seem disjointed. Included are lighter snacks and heartier small plates and the $4 to $8 price range encourages ordering a selection for sampling. A ramekin of house-marinated olives with garlic chili and orange peel hits the spot for a solo visitor enjoying a pre- or post-dinner tipple, while a twosome might share an order of Salvador Masa Cakes, which consists of two fluffy corn cakes topped with refried beans, queso fresco, and a Salvadoran cabbage relish called curtido. Momo’s riff on jhal muri, a Bengali street snack, makes a perfect accompaniment to draft beer or a white glass of wine. Photo by Matt Kelly at Phuture Photography. Regardless of group size, the house-made jhal muri is a must-order. 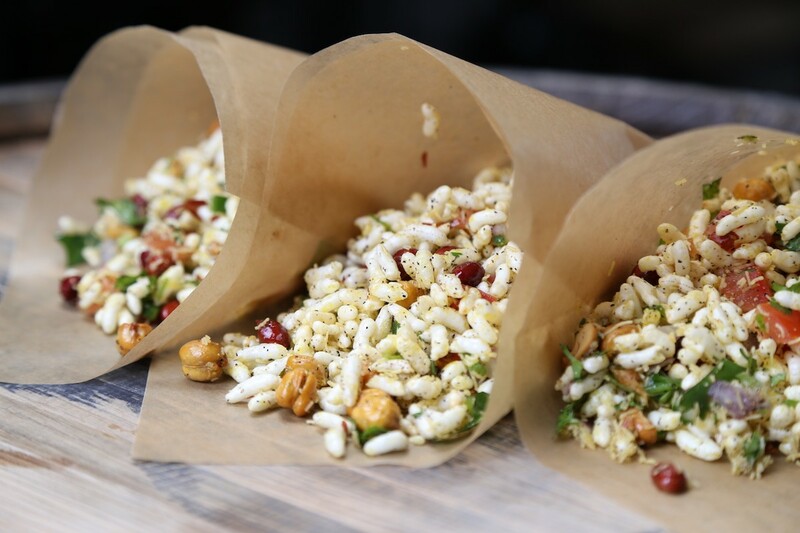 Jamaluddin’s take on the Bengali street food snack comes served in a tasteful paper cone filled with puffed rice, fried lentils, peanuts, tomato, onion, cilantro, green chili and mustard oil. The crispiness of the rice and lentils, combined with the spice from the mustard oil and the pleasant crunch of fresh tomato and onion felt refreshing, even on a cold winter day. The wine list offers pleasant surprises: a thoughtful list of approachable but interesting options from all over the world. Choices like a silky chenin blanc from India or a Greek rosé made with a rare grape blend encourage customers to branch out without taking them too far from their comfort zones. A knowledgeable staff helps to ensure a selection that works with individual food orders and tastes. For the wine-averse, cocktails and beers on tap are available. Though it’s an ideal place for date night, Momo’s easy-to reach location, low-key weeknight environment and wi-fi also make it a perfect spot for early evening meetings. On Sundays, the all-day brunch menu offers dishes geared to satisfy a variety of palates, with options ranging from Belgian waffles to The Hangover, a base of fried yuca topped with beer-braised beef and soft scrambled eggs. Look for parking in a small lot that runs alongside the building at Cleburne Street; street parking is usually available if spots are full. Momo Food & Wine is open from 4 to 10 p.m. Tuesdays through Thursdays, 4 p.m. to midnight Fridays and Saturdays, and 10 a.m. to 6 p.m. on Sundays. Consider adding the address to the article. Thanks for the catch! We normally do; apologies that it got left out of this article. We’ve added it.